You should never install, or have installed on your property, a vehicular gate operator that does not carry the "MARK" of an NRTL such as ETL or UL. You should also be aware that NRTL's do not "approve" or "certify" products that they test. Manufacturers that use this terminology are incorrect in its usage. When a product is tested by an NRTL, and that product is found to be in compliance with the safety standard, then that product is said to be "LISTED" and the manufacturer receives a "MARK" and an "Authorization to Label" from the NRTL. The standard to which vehicular gate operators are manufactured and tested to is U.L 325 - Underwriters Laboratories Inc., Standard for Safety: Door, Drapery, Gate, Louver, and Window Operators and Systems. 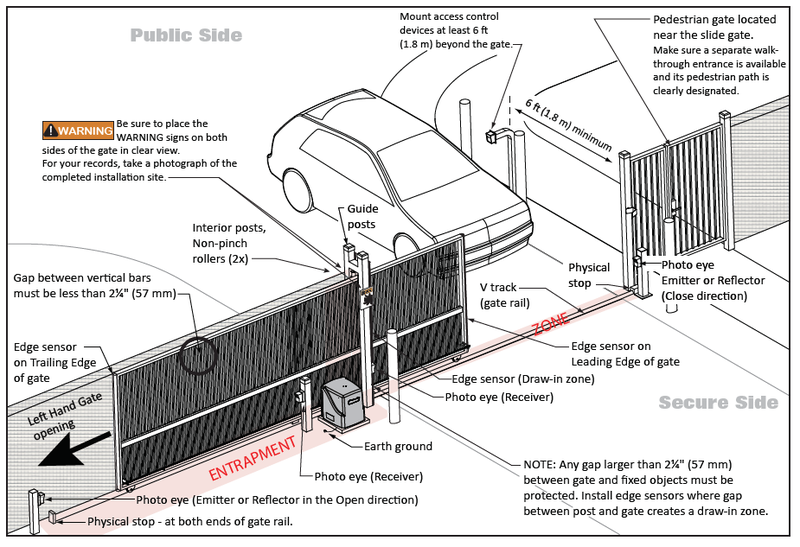 In addition to the 325 standard, vehicular gate operators must also be tested to U.L. 991 - Tests for Safety-Related Controls Employing Solid-State Devices. UL 325 is the Underwriters Laboratories (UL) standard for Door and Gate Operators, as well as other products—to which, LiftMaster products are tested. Since 2010 all commercial door operators bearing the UL Label must continuously monitor safety devices such as photo eyes and/or sensing edges, otherwise the operator must be limited to constant-pressure-to-close operation. 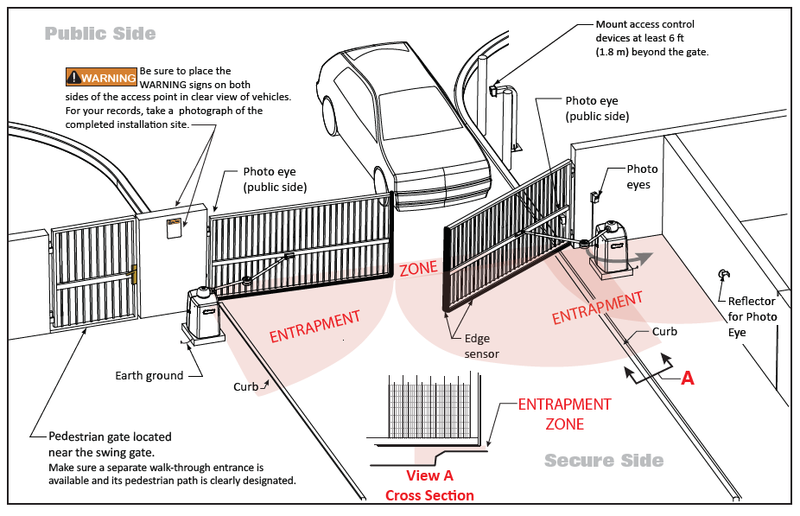 Since 2000, external entrapment protection devices must be added to gate operators to meet these standards. Gate operator designs will be additionally required to continuously monitor entrapment protection devices by January 2016. Your installer will recommend correct equipment based on your system. Manufacturers of Listed and Labeled operators are subject to quarterly inspections at their manufacturing facility by UL or ETL inspectors to ensure that the operators being manufactured are in compliance. Use tested and approved photo eyes and edge sensors.